For those of you who liked Arthur Streeton's painting of the Hawkesbury River which featured in Who painted this? #4, I've developed a new website about him. About Arthur Streeton - Australian Landscape Painter includes all the links to information and images which I could find online last week and I have to say I'm very impressed. It only goes to remind me what a northern hemisphere view of art history we seen to have at times. I found this page, created by the National Government, on The Heidelberg School: Sydney, its beaches, the harbour and the Hawkesbury to be particularly helpful in understanding more about the context of Australian landscape painting. The Heidelberg School was a group of impressionist painters who included Tom Roberts, Arthur Streeton, Frederick McCubbin and Charles Conder. Golden Summer, Eaglemont is one of the best-known paintings of the Heidelberg School and has long been recognised as an Australian masterpiece. 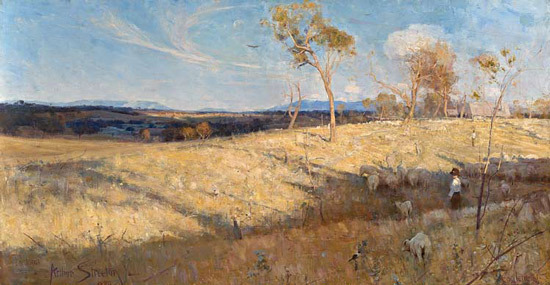 24 61325 - Arthur Streeton 'Golden summer, Eaglemont' 1889 from National Gallery of Australia on Vimeo. 26th November 2012 - Who's made a mark this week? 18th November 2012 - Who's made a mark this week? 11th November 2012 - Who's made a mark this week?